• Felipe Fernández-Armesto, Columbus (Oxford,1991). This superb Spanish author and Columbus scholar carefully uses primary and corroborated sources to place Columbus in context. Good chronology. • Samuel Eliot Morison, Admiral of the Ocean Sea: A Life of Christopher Columbus (Little, Brown, 1942). This classic brought the author the Pulitzer Prize. Loaded with maps. 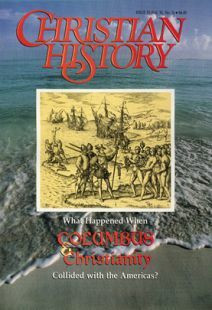 • Herman J. Viola and Carolyn Margolis, Seeds of Change: Five Hundred Years Since Columbus (Smithsonian, 1991). A magnificent treatment of the Smithsonian exhibit on five transforming “seeds”: sugar, maize, disease, the horse, and the potato. Newsweek’s “When Worlds Collide” (Fall/Winter, 1991) summarizes the exhibit and book. • Delco C. West and August Kling, translators, The Libro de las profecías of Christopher Columbus Florida, 1991); Kay Brigham, Christopher Columbus’s Book of Prophecies: Reproduction of the Original Manuscript with English Translation (TSELF, 1991). Translations of Columbus’s unique work; they give insight into his religious mind. • Enrique Dussel, A History of the Church in Latin America: Colonialism to Liberation (Eerdmans, 1981). Systematic, penetrating research from a Catholic, liberationist perspective. • H. McKennie Goodpasture, ed., Cross and Sword: An Eyewitness History of Christianity in Latin America (Orbis, 1989). An excellent anthology of letters and documents from 1492 to present. • Miguel Leon-Portilla, ed., The Broken Spears: The Aztec Account of the Conquest of Mexico (Beacon, 1992). An invaluable look through native’s eyes. • Charles H . Lippy, Robert Choquette, and Stafford Poole, Christianity Comes to the Americas: 1492–1776, (Giniger, 1992). A detailed overview of Spanish, French, and British missionary efforts in the Americas. • John A. Mackay, The Other Spanish Christ (Macmillan, 1932). An unsurpassed classic, available only in libraries. Mackay asks: Which Christ came to Latin America in the Conquest? • David Martin, Tongues of Fire: The Explosion of Protestantism in Latin America (Basil Blackwell, 1991). A significant work by a British sociologist, sympathetically documenting what scholars had wished to ignore-the striking growth of the evangelical churches. • George Sanderlin, ed. and trans., Bartolomé de Las Casas: A Selection of His Writings (Knopf, 1971). A good selection of Las Casas’s writings, placed in proper context. • David Stoll, Is Latin America Turning Protestant? The Politics of Evangelical Growth (California, 1990). Stoll, from an anthropological perspective, analyzes the growth of evangelicalism. Dr. William D. Taylor is co-author with Emilio A. Núñez C., of Crisis in Latin America: An Evangelical Perspective (Moody, 1989). As sincere believers marched to subjugate a continent, other Christians had to oppose them. Courageous Christians who worked on behalf of “the least of these” in the Americas. The paradoxical men who conquered Latin America. Junipero Serra launched a remarkable enterprise on Spain’s final frontier.